Want to have all the fun of Gymja Warrior at your event, field day, or party? Our Gymja2Go service will bring a variety of options to fit exactly what you need! Gymja2Go is designed differently for every event that we participate in. We can accomodate a large variety of events such as field days, fairs, birthday parties, motivational performances and more! We offer multiple pricing packages to exactly fit your events needs, and make sure that every Gymja2Go event is memorable. With your Gymja2Go event we will provide highly professional and certified coaches to guide participants through the various techniques to accomplish the obstacles we bring. 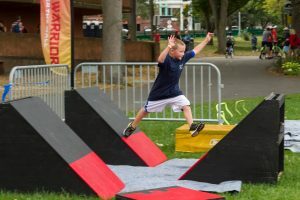 Whether it be the warped walls, parkour obstacles, balance courses, trampolines, and more, we will show you how to succeed! Call or email us at events@gymjawarrior.com to create your own Gymja2Go Event!